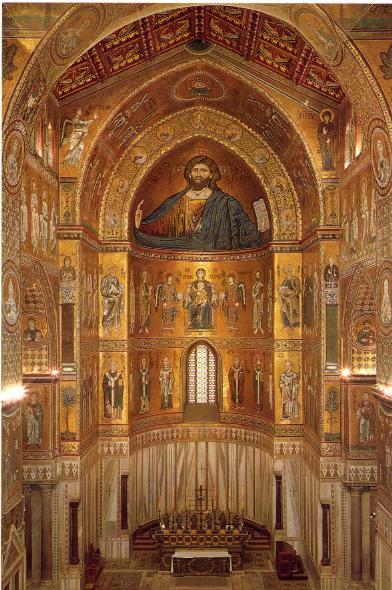 Monreale Cathedral was built in 1172 by William II, the third Norman king of Sicily, and Byzantine craftsmen were employed to create the masterpieces inside.Visitors are immediately struck by the golden vision of Old Testament tales on the walls of the nave and aisles. God creating the Earth and Heavens is the subject of the first panel in the top left-hand corner of the nave. Moving clockwise around the four sides, the history of the Israelites is depicted in gold, blue and red, while the aisles, choir and transepts tell the story of Christ, his miracles, betrayal and crucifixion. There is so much to see inside the cathedral but perhaps the mosaic cycle is the most incredible feature. The attention to detail in the facial expressions of the Virgin Mary holding an infant Jesus for example, the brightness of the gold and lapis lazuli and the complexity of emotion expressed give a real sense of awe and wonder.